Hook-up more machines or extend your reach with additional hoses. Save time by eliminating the need to switch one hose from machine to machine. Our all-new, see-through, crush-proof, 2-1/2" premium dust collection hose lets you spot those clogs in a flash. It can be stepped-on without consequences. It is available in an extended 16' length that will let you hook-up to virtually any machine -- anywhere in your shop without moving your DC-3300. Available in 16' and 10' lengths for your convenience. 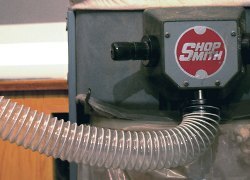 Note that all of our Shopsmith 2-1/2" dust collection hoses come with a 2-1/2" male end included and installed on both the in-feed and out-feed ends of each hose. Since many competitive hoses do not come with ends, be aware of the fact that due to slight variations in the pitch of the attaching threads ends are often not compatible with certain hoses. Be aware also that if they're not included with the hose you want, due to the rigidity of the hoses, two hose ends can be quite difficult to attach. 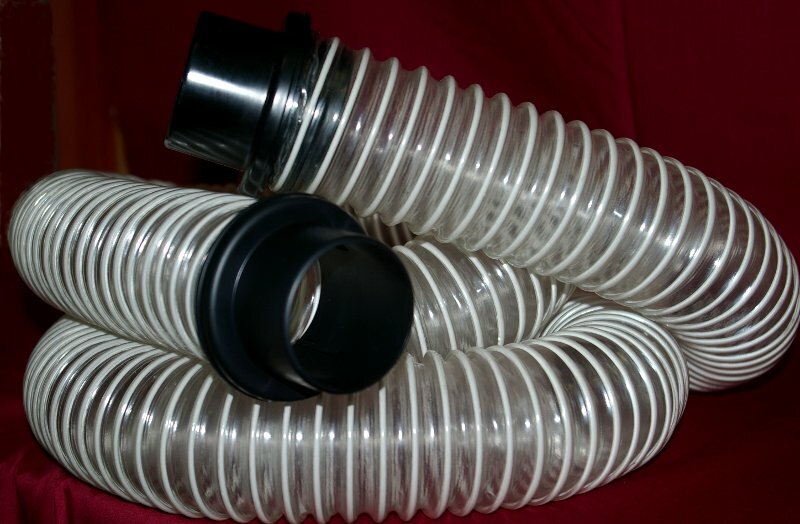 Standard 8 foot dust collection hose with male fittings on each end. 2-1/2" diameter.